In 1819 deep in the jungles of India, a man is hot on the tail of a wild tiger. Suddenly, he spots something strange in the cliffs high above him. So he climbs up to investigate… and discovers, amazingly, a secret that has lain hidden for hundreds of years. This incredible scene took place in 1819. The protagonist was British cavalryman John Smith, and on that fateful day he was out hunting in what is now Aurangabad, a district of Maharashtra in western India. Close to the Waghora River, he noticed an opening in the rocks above. Realizing that the cave looked man-made, Smith and his party scaled the rocks to take a closer look. Then he fashioned a flaming torch from grass to light his way and tentatively stepped inside. Needless to say, Smith was in for a surprise when he entered the opening in the cliffs. Indeed, he found himself in a grand hall lined with columns, its walls decorated with paintings that were faded by age. Exploring further, Smith discovered a bodhisattva – a carving of a Buddhist devotee at one of the stages of achieving nirvana. Inconceivably, but with typical colonial carelessness, he scratched his name on the body of the statue. He was, therefore, the first of many to leave his mark on what became known as the Ajanta Caves. Located 280 miles to the east of Mumbai, the caves are thought to date back to the second century BC. They consist of 30 halls and feature religious structures hewn into the rock face up to 100 feet above the river below. Experts believe that the caves were created over a period of many hundreds of years. Indeed, after the initial construction in the second century BC, work began on a second group of caves some time around the fifth century AD. The structures here were built for Buddhist monks as a place in which to live and worship. There were, for example, caves allocated for different activities, such as sleeping and education, and many monks would have been trained at the facility. In fact, it is thought that at their peak the Ajanta Caves were home to several hundred men. However, over time, Buddhism began to lose its grip on the region, and Hinduism rose to become the dominant religion once again. Consequently, the caves, with their Buddhist significance, were abandoned, and nature began to reclaim the site. So, for more than 1,000 years, the Ajanta Caves remained buried in a remote corner of India as the world changed around them. Sadly, there was nobody to watch them fall into disrepair as the years passed – apart, that is, from a few local goat herders who used parts of the caves for shelter. But all that changed with Smith and the discovery that he made in 1819. In fact, after that day the fame of the caves spread quickly throughout the world. Certainly, the stunning architecture of the caves and the exquisite artwork found within them soon established the area as an archaeological site of note. In 1844, for instance, the Royal Asiatic Society commissioned Major Robert Gill to recreate some of the stunning paintings that lined the walls of the caves. His task was a difficult one: he had to slave away in intense heat while remaining vigilant to the threat not only from tigers, but also the hostile local Bhil people. Despite such difficulties, however, Gill and his fellow adventurers discovered some incredible treasures that still draw visitors to the Ajanta Caves to this day. Suffice to say, then, that the caves, with their complex system of halls and cells, represent an incredible architectural feat. Indeed, most of the caves are vihara halls, multi-purpose spaces once used for worship, sleeping and living. Each one consists of a central space featuring a Buddhist shrine, surrounded by smaller cells where the monks would go about their daily lives. Interestingly, the first caves to be built were adorned with simple columns and painted with figures from Buddhist teachings. Later, during the second period of construction, more elaborate architecture and artwork appeared. Meanwhile, throughout the caves, thousands of beautiful images recreate stories from the lives of Buddha. For example, men, women and animals are depicted in rich and detailed scenes, painted by skilled artists who studded their work with precious stones. In what’s known as Cave One, an elaborate façade is covered in detailed carvings and reliefs. In others, meanwhile, mound-shaped shrines known as stupas create focal points. Additionally, Cave Two features a series of paintings depicting women in significant and powerful roles – leading some to suggest that a woman may have been responsible for funding at least part of the site. Today, reaching the Ajanta Caves is less of an adventure than it was 200 years ago. Since then, of course, the ropes and ladders that Gill and his contemporaries were forced to climb have been replaced by a modern path, and the caves have firmly taken their place on the tourist map of western India. Indeed, in 1983, the caves won recognition as a UNESCO World Heritage Site, furthering their reputation as a unique and fascinating slice of history. Meanwhile, their location close to the famous Ellora Caves boosted their popularity, and by 2010 the site was attracting almost 400,000 visitors a year. These days, then, a tour of the region isn’t complete without a visit to the Ajanta Caves. And despite the site’s popularity – so great that in 2013 a Mumbai designer launched four replica caves to ease overcrowding – the haunting magic of these vast structures carved into the rock so long ago endures. Archaeologists have uncovered what may be the largest royal tomb found in more than a century of work on Maya ruins in Belize, along with a puzzling set of hieroglyphic panels that provide clues to a “snake dynasty” that conquered many of its neighbors some 1,300 years ago. The tomb was unearthed at the ruins of Xunantunich, a city on the Mopan river in western Belize that served as a ceremonial center in the final centuries of Maya dominance around 600 to 800 AD. Archaeologists found the chamber 16ft to 26ft below ground, where it had been hidden under more than a millennium of dirt and debris. Researchers found the tomb as they excavated a central stairway of a large structure: within were the remains of a male adult, somewhere between 20 and 30 years old, lying supine with his head to the south. The archaeologist Jaime Awe said preliminary analysis by osteologists found the man was athletic and “quite muscular” at his death, and that more analysis should provide clues about his identity, health and cause of death. In the grave, archaeologists also found jaguar and deer bones, six jade beads, possibly from a necklace, 13 obsidian blades and 36 ceramic vessels. At the base of the stairway, they found two offering caches that had nine obsidian and 28 chert flints and eccentrics – chipped artefacts that resemble flints but are carved into the shapes of animals, leaves or other symbols. “It certainly has been a great field season for us,” said Awe, who led a team from his own school, Northern Arizona University, and the Belize Institute ofArchaeology. The tomb represents an extraordinary find, if only for its construction. At 4.5 meters by 2.4 meters, it is “one of the largest burial chambers ever discovered in Belize”, Awe said. It appears to differ dramatically from other grave sites of the era. Most Maya tombs were built “intrusively”, as additions to existing structures, but the new tomb was built simultaneously with the structure around it – a common practice among cultures such as the ancient Egyptians, but uncommon among the Mayas. Many Maya societies ruled through dynastic families. Tombs for male and femalerulers have been found, including those of the so-called “snake dynasty”, named for the snake-head emblem associated with its house. The family had a string of conquests in the seventh century, and ruled from two capital cities. Awe said the newly discovered hieroglyphic panels could prove “even more important than the tomb”, by providing clues to the dynasty’s history. The panels are believed to be part of a staircase originally built 26 miles to the south, at the ancient city of Caracol. Epigraphers say the city’s ruler, Lord Kan II of the snake dynasty, recorded his defeat of another city, Naranjo, on the hieroglyph, to go with his many other self-commemorations. On another work, he recorded a ball game involving a captured Naranjo leader whom he eventually sacrificed. Naranjo apparently had its revenge some years later, in 680AD, having the panels dismantled and partially reassembled at home with gaps and incorrect syntax – possibly deliberately, to obscure the story of the snake dynasties’ conquests. Fragments have been discovered elsewhere in Caracol and at a fourth site along the Mopan river, but Awe said the new panels could be “bookends” to the story of war and sacrifice in the ancient Maya world. According to the University of Copenhagen’s Christophe Helmke, the research team’s epigrapher, the panels provide a clue for Kan II’s conquests – he appears to have dedicated or commissioned the work in 642AD – and they note the death of Kan’s mother, Lady Batz’ Ek’. The panels also identify a previously unknown ruler from the Mexican site of Calakmul, Awe said. Helmke said the panels “tell us of the existence of a king of the dynasty that was murky figure at best, who is clearly named as Waxaklajuun Ubaah Kan” . This ruler reigned sometime between 630 and 640AD, and may have been Kan’s half-brother. “This means that there were two contenders to the throne, both carrying the same dynastic title, which appears to have been read Kanu’l Ajaw, ‘king of the place where snakes abound’,” he wrote in an email. The panels clarify what Helmke called a “tumultuous phase of the snake-head dynasty” and explain how it splintered between cities before dominating Maya politics in the region. The panels identify the origin of the snake dynasty at Dzibanche, in the Yucatan peninsula of modern Mexico, and refer to the family’s move to their capital of Calakmul. Awe said Lady Batz’ Ek’ “was likely a native of Yakha, a site in neighboring Guatemala, who later married the ruler of Caracol as part of a marriage alliance”. The researchers have had their work peer-reviewed for publication in the Journal of the Pre-columbian Art Research Institute. Awe said it was not clear why the panels appeared in Xunantunich, but the city may have allied itself with or been a vassal state to Naranjo. The cities both fell into decline, along with other Maya societies, around 800 to 1,000AD, for reasons still mysterious but possibly including climate change, disease and war. The city was called Xunantunich, meaning “stone woman” in the Yucatec Maya, long after its abandonment by original residents. The name derives from folklore around the city about a hunter who saw a ghostly, statuesque woman, dressed in indigenous garb, standing near an entrance to a temple called El Castillo – a storytouted by tourist sites today. The site was also once called Mount Maloney, after a British governor. TWO GIANT UNDERWATER CRYSTAL PYRAMIDS DISCOVERED IN THE CENTER OF THE BERMUDA TRIANGLE…. Shackled remains at ancient Greek site tell tale of intrigue…. ATHENS (Reuters) – At least 80 skeletons lie in a mass grave in an ancient Greek cemetery, their wrists clamped by iron shackles. They are the victims, say archaeologists, of a mass execution. But who they were, how they got there and why they appear to have been buried with a measure of respect – that all remains a mystery. They were found earlier this year in part of the Falyron Delta necropolis – a large ancient cemetery unearthed during the construction of a national opera house and library between downtown Athens and the port of Piraeus. Few people have been able to get in to have a close look. 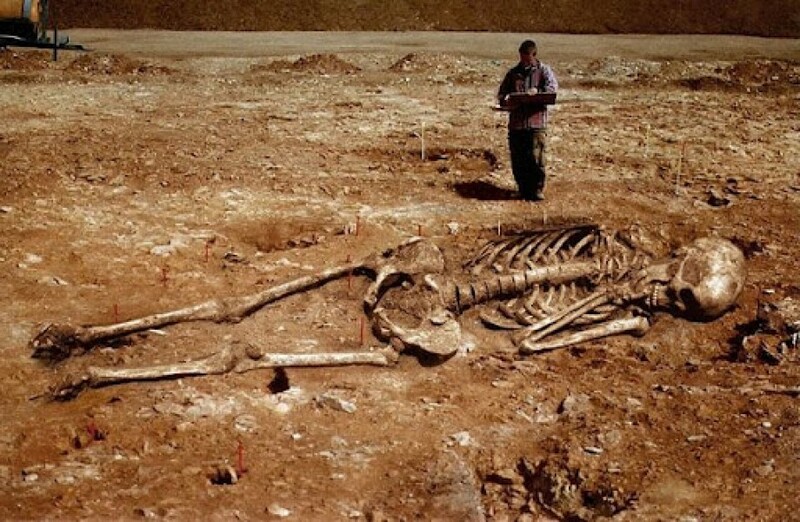 But on a rare tour of the site, archaeologists carefully showed Reuters the skeletons, some lying in a long neat row in the dug-out sandy ground, others piled on top of each other, arms and legs twisted with their jaws hanging open. “They have been executed, all in the same manner. But they have been buried with respect,” Dr. Stella Chryssoulaki, head of excavations, said. The experts hope DNA testing and research by anthropologists will uncover exactly how the rows of people died. Whatever happened was violent – most had their arms bound above their heads, the wrists tied together. But the orderly way they have been buried suggest these were more than slaves or common criminals. The cemetery dates from between the 8th and 5th century BC. “It is a period of great unrest for Athenian society, a period where aristocrats, nobles, are battling with each other for power,” said Chryssoulaki. One of the strongest theories is that they were supporters of Cylon, an Athenian noble and Olympic champion who staged an attempted coup in Athens in 632 BC with the help of his father-in–law, the tyrant of Megara. The coup failed and Cylon hid in a temple of the Acropolis. He managed to escape, but the people who backed him were killed. “Perhaps with the DNA tests that we will do on these skeletons we may confirm or not this hypothesis that these deceased, these young people could be … part of a coup … an attempt by a noble to take power by force,” said Chryssoulaki. More than 1,500 bodies lie in the whole cemetery, some infants laid to rest in ceramic pots, other adults burned on funeral pyres or buried in stone coffins. One casket is made from a wooden boat. Unlike Athens’ renowned ancient Kerameikos cemetery, the last resting place of many prominent ancient Greeks, these appear to be the inhabitants of regular neighborhoods. The dig is within a 170,000 sq m landscaped park, shadowed by the vast new modern library and opera house buildings being built by the Stavros Niarchos philanthropic foundation. High-rise apartments dot the skyline to the north while a noisy motorway snakes by the site’s east side. Chryssoulaki wants to see a museum built on the spot, as a monument to the daily lives of Athenians from another era. “A cemetery is a first and last photograph in antiquity of those people that pass from life to death,” she said.